The inspiration behind this site is my house. A number of people have paid me the supreme compliment of saying that my house belongs on Wild Chicago, a local PBS program about odd and interesting places in Chicago. While you won’t find the Seven-Up bottle from Jordan, or the matchbook from Cal-Neva Lodge, or the roof tile from Jimmy Wong’s Restaurant here, I hope you will find equally interesting and unusual digital items. 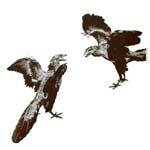 The Maniraptora are the class of dinosaurs from which birds are believed to be descended. I was a volunteer at the Field Museum in Chicago, and my specialty was dinosaurs. 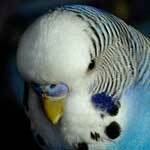 Also, I have been owned by a succession of budgerigars, the current one being Yildirim Pasha (Turkish for “Lord Thunderbolt”). So the name “Maniraptora” was a natural choice. Like all web sites and airports, Maniraptora is a work in progress. I hope to be adding more departments and pictures as time goes on. So take a look around now, and do stop by on a regular basis.